Mexico: Sanson, Cuatrero, Ultimo Guerrero, Diamante Azul, Caristico, Hechicero, Euforia, Terrible, Voldaor Jr. The match was originally announced as 8v8. Taven & Volador were added a few minutes after the rest of the lineup was announced. It did come off as a authentic last minute decision; CMLL had art announcing four of the people being added, but just a screen shot of Informa for Taven & Volador. Rush took to Twitter to make it clear he was upset about not being included. 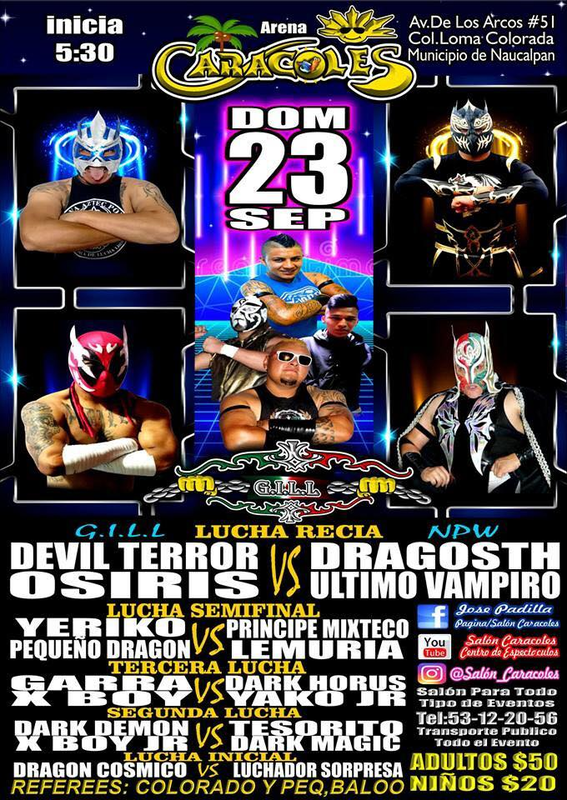 It does seem odd the two people who won the Aniversario match are not involved. On the other hand, Rush got himself DQed last year. Michael Elgin replaces Volcano on Monday in Puebla. This headline says “LA Park has decided when the date he’s going to retire.” He’s not really decisive if you read the article, literally saying “I do not know when I will retire, only God knows.” The date the headline is pointing towards is “two years”, but even then he’s just going to see how he’s doing by then. He could go longer, he could go shorter if he gets hurt. “Two Years” is the standard lucha libre length of time that seems close enough to be real but far enough away that you don’t have to actually do anything about it. That article also includes LA Park taking credit for business going up this year in CMLL & AAA and saying business would go up if more talent could go back and forth. I think he’s right in the short term, but wrong in the long term. There’d be no long term planning, everyone would just be running thru the ready made big matches, and then there’d be less interest than ever when those matches are exhausted. The article also has interviews with Rush & Psycho Clown, and had a great design in the newspaper version. Alberto says wrestling is not serious enough now, with too much interference in title matches. He praises Dr. Wagner Jr. and LA Park as those who maintain the respect of wrestling. No one does more interference and shenanigans in title matches and all matches than Dr. Wagner Jr. and LA Park. Tirantes explained the great conspiracy against himself and the wrestling fans of Xalapa is Arena Xalapa raised the rent after their first show. Tirantes was going to promote four shows in Xalapa with CMLL talent. He ran one, it went well, and then the owners of the building (listed as Martinez Aguilar family) raised the rent “four fold.” A lawyer representing the family says they had agreed to the amount in a contract and they had not signed one for the second and third dates. Tirantes says he still wants to run the shows and the project – despite not having a building or firm dates – is more alive than ever. If you know of a building Xalapa which wants to host CMLL events, his number is listed in the article. The La Planchitas column not only reveals Bengala & Lady Shani are a couple, but says they’re planning to get married soon. CMLL looks back to Apolo Dantes winning the 1998 Gran Prix. Apolo Dantes with hair looks odd. Hechicero was the guest on the weekly Marca lucha libre interview segment, talking about how wrestling is an art of improvisation. AAA will be participating in an international book fair for children in November. Leo Riano complains about not enough Dave the Clown on AAA TV, saying Dave the Clown is one of AAA wrestlers doing the best. Voice of Wrestling has an article about the differences in visiting Arena Mexico at the Aniversario show. The main event should at least be fun. Tiger and Blue Panther Jr. are going back and forth on Twitter, which is good since they seem stuck facing each other once a week with zero resolution for the next decade. Raziel will go at least 112 days without a match. It has to be a serious injury or a retirement, but I’ve dropped him off the active CMLL roster at this point because he’s definitely not active. Instead of getting one of the two feuds, Guadalajara is getting both. Which makes the boring Mexico City cards stand out more. Guadalajara has a “(Guerrero) Samurai” but never a Mr. Samurai. New person or typo, it’s a coin toss.